Do you ever sleep in your homemade dresses because you can't bring yourself to take them off? I confessed on Twitter this week that that's exactly how I felt while making Lola. 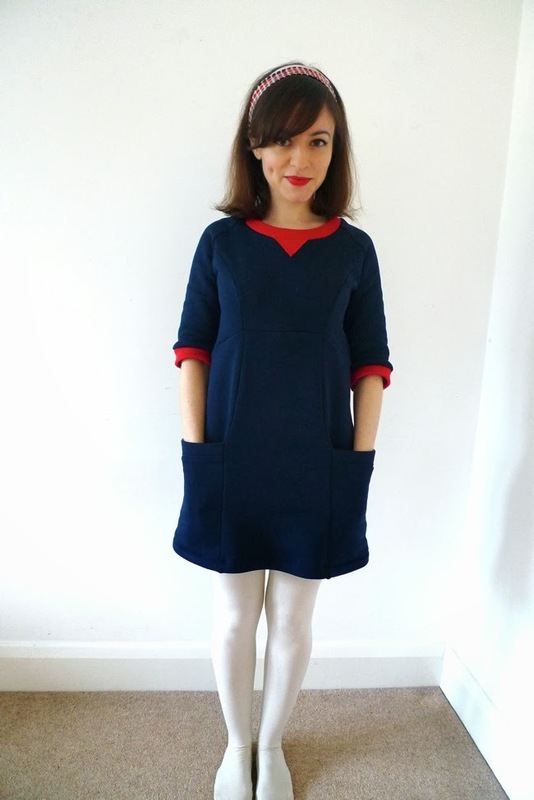 Turns out that Kristiann, the talented lady who designed this dress, often wears her Lola to bed. Who can blame her? 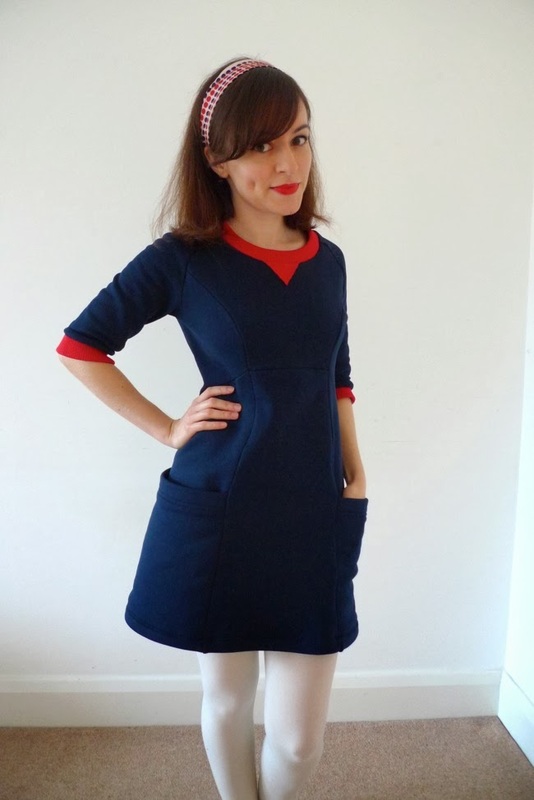 Lola is an easy-fitting sweater dress from Victory Patterns. The pattern was given to me to review by Backstitch. They stock a mouthwatering selection of indie dressmaking patterns from the likes of Victory, Wiksten, Megan Nielsen and more. What's quite unusual is that Backstitch also sell digital versions of some of the patterns, so if you want to make your own Lola, like, NOW, then you can! Mine is made in a thick fleece-lined sweatshirt knit, 'Adidas' according to the man I bought it from in Goldhawk Road, and actually I believe him as the quality is excellent. It is just sooooo warm and snuggly, it's like wearing a duvet! A duvet with massive pockets. I opted for a contrast neckband and cuffs in a red rib knit from The Cloth House. 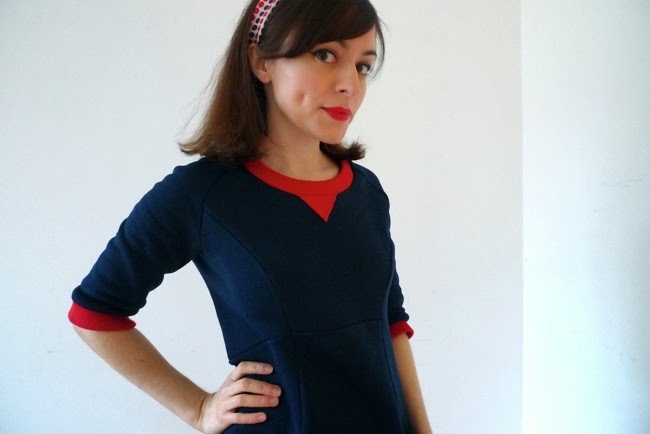 The design also calls for a rib knit hem band, but I decided to leave it out. Firstly because the stretch of the rib knit would pull the hem in slightly just below my bootilicious hips and thus accentuate them, and secondly because the contrast stripe cutting horizontally across my thighs would make me look even more vertically challenged than I am already - all in all, it wouldn't be a great look on me. So instead I overlocked the hem, turned it under and topstitched it, trimming the pocket seams down first to reduce the bulk under the hem. I love the style lines of this dress, with the princess seams flowing down the body and the curved waistline swooping from empire waist at the front to drop waist at the back. However, the complex way the pieces come together did mean that adjusting the pattern to fit me was a pain in the bum. I couldn't be bothered to make a toile, just made some changes to the pattern based on my measurements before cutting the fabric, shortening the torso and grading between three sizes to match my proportions. I made new lengthen/shorten lines as they didn't seem to go full circumference, and there was a bit of guesswork involved in which part of which seam would need to be at which point between the three sizes I was grading between... but I got there in the end! 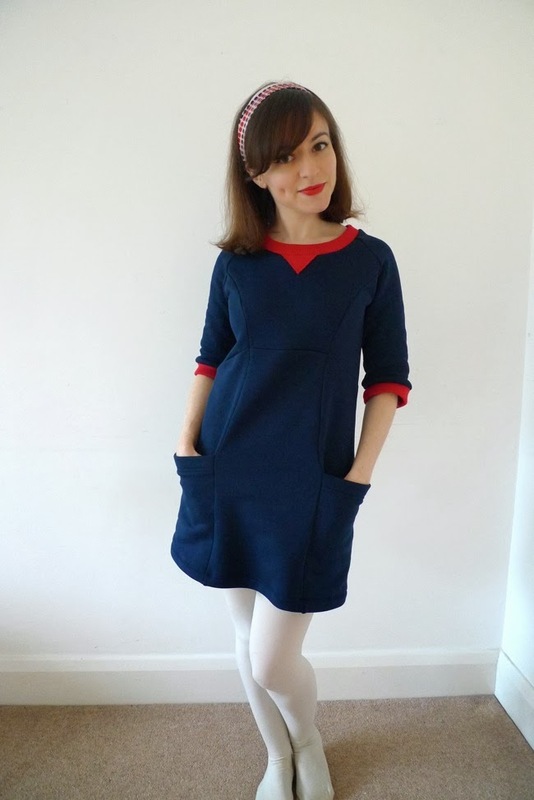 And once I'd figured that out, the actual sewing was super speedy, I just whizzed it through my overlocker and had a finished dress in no time. Conclusion? This is one of my favourite things I've ever made. A snuggly, stylish, wearable duvet. With mammoth pockets. What more can you want? Want to see THE most favouritest thing I've ever made? It's just gone to print - eep! PS. Mum - stop looking at the Nora Batty wrinkles in my tights!